Rely on D F Landscape if you want to ensure your lawn, plants, shrubs, and trees look great all year round. We offer highly reliable landscape maintenance services to Orange County homes and small commercial properties at very cost-efficient rates. We have served thousands of clients over the last 30 years, and have a solid reputation for quality work, excellent communication, and superior customer service. As a result, the vast majority of our work continues to come from referrals and repeat business. Our landscaping maintenance services can include pruning trees, trimming hedges, blowing away dead leaves, clearing debris from walkways, mowing lawns, weeding and weed guard application, fertilizing, gardening, checking irrigation (particularly important if it is all underground), sprinkler repairs and replacement, drainage corrections, and other groundskeeping services. These services are recommended for clients who wish to keep the landscaped areas of yards, store frontage areas, parking lot islands, pool areas, and other spaces thriving, under control, and beautiful. At D F Landscape, our staff members are all highly skilled and have an average of 10 to 15 years of landscape maintenance experience. 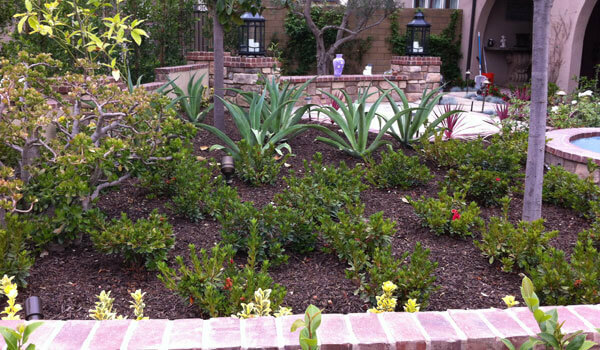 Call us today for all of your landscape maintenance needs in Orange County. We are available seven days a week and receive calls on a 24-hour basis for any emergencies that might arise. For those that wish to reduce their landscape maintenance needs and water usage, we also offer free onsite drought-resistant landscape consultations and estimates.